Before the invention of internal combustion engines the hand-car was the primary vehicle used for maintaining hundreds of thousands of miles of railroad tracks. Since it is a human powered vehicle, and considering the iron construction of the vehicle, it was not a joy to ride as seen in the movies. Also, considering the additional load on these hand cars the drivers should be a muscular and lean man to save on the extra weight. Hand cars were also known by different names depending on who manufactured them. A few names for this vehicle are: pump trolley, pump car, jigger, Kalamazoo and velocipede. This vehicle is powered by rucking four bar mechanism. This mechanism.s crank makes a full rotation, but the hand bar will ruck up and down or back and forth depending on the design of the handcar. 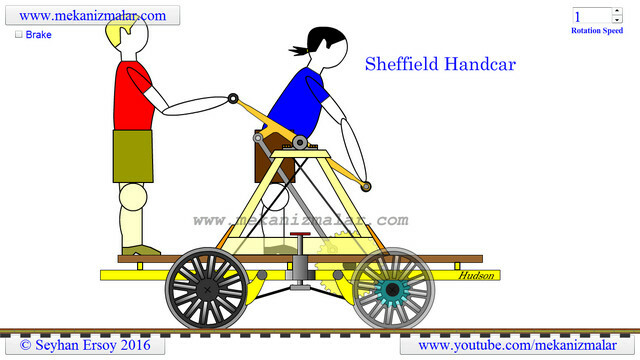 This animation is of a Sheffield Handcar. Initially, I thought it would be an interesting animation to make and the more I worked on it the more I began to appreciate its design. I have never seen a handcar close up, but the ingenuity of the Sheffield design is that the man powering the device gives full power to the car by putting his weight on the handle bar. The handle bar comes up by the pushing action of the second man. If a pulling action was performed when more power was needed it would put stress on the back bone of the man. If anyone has ridden on one of these cars, please let me know if this is correct or not. The Sheffield hand car seen in this animation can be driven by up to five people. In the video only two men are shown. The blond haired man is located on the right and the black haired man is on the left hand of the rocking handle bar. The large yellow gear shown here is driven by a crank mechanism powered by the rucking motion of the rocking handle bar. The yellow gear is connected to a smaller blue gear attached on the axle. Notice that the location and configuration of the tongue like extension on the rocking handle bar enables the push action to move the vehicle. Tension bars shown here with black lines gives stability to A shaped walking beam construction, which may rock back and forth if they were not there. During an emergency, the brake pedal, located very close to the man in the front, can be activated by just pressing on the brake pedal. Since relatively light construction of hand car, it would be taken out of track by using handle bars if there is a train on the track. From what I have seen, the man in the front (dark hair in your example) would stand at the far end of the car and face backward. There is no need to steer a rail car so there is no need for both of them to face the same direction.